Enzymes are life's little way of taking shortcuts, speeding up chemical reactions to permit the diverse and intricate metabolic pathways by which living organisms do what they do. In addition to being filled with enzymes helping to ensure our bodies work properly, we've figured out ways to produce bucketloads of them on their own to help speed along various tasks. By sticking genes into bacteria, fungi, or cells from a hamster's ovaries, we can give them specialized instructions on how to make a particular enzyme along with marching orders to ensure lots of it gets made. From there it's just a matter of growing a bunch of the cells in tanks of nutritious liquid and isolating the enzyme from the resulting goo. We can do a similar thing with plants such as tobacco, but this involves greenhouses instead of goo chambers. For this post I'm going to take a look at manufactured enzymes we use at home. They're all over the place, once you start looking closely! Let's start with food. 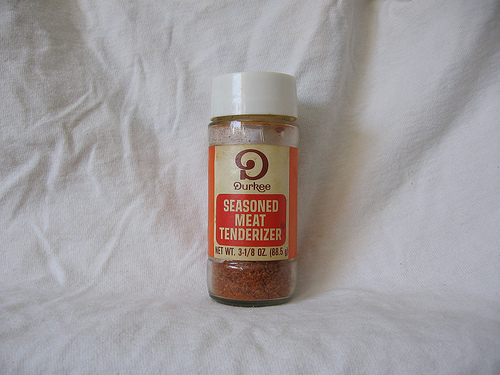 A common enzyme found in homes typically hides among kitchen collections of herbs and spices as a powder labelled as meat tenderizer. This powder is usually prepared from either papayas, which contain papain, or pineapples, which make bromelain. These enzymes are proteases, which means they can break apart proteins (specifically the peptide bonds joining together individual amino acids). Since meat is a bunch of protein, having a protease go to work on it can reduce its toughness. Specifically, the enzymes act to break down collagen, which makes up muscle-associated connective tissue aka sinew aka tendons and ligaments aka the tougher parts of a cut of meat. Meat tenderizer is also used by some as a home remedy for insect stings, but this appears to be bunk/placebo effect (see: , ). At the dinner table, enzymes are sometimes taken as oral supplements to help us digest certain foods. They're formulated in such a way as to ensure they can pass unscathed through a stomach full of hydrochloric acid into the intestine where they do their thing. Lactase is used to break apart lactose, a sugar found in milk and its derivatives, into the glucose and galactose molecules of which it is composed. The lining of some folks' intestines doesn't produce much of this enzyme, so lactose ends up sticking around inside their guts instead of being split apart and absorbed, leading to pain, bloating, and diarrhea. Speaking from experience, lactose intolerance is not fun. Fortunately, we can manufacture lactase using the fungus Aspergillus oryzae and package it into convenient little pills to take with meals. Being born with the inability to digest sucrose and maltose, sugars found in fruits and grains, is referred to as having congenital sucrase-isomaltase deficiency. It's akin to a severe lactose intolerance, and is important to recognize in infants to avoid the resulting stomach problems and potential for malnutrition and stunted growth. People with the deficiency have the option of taking sacrosidase, an enzyme produced using the yeast Saccharomyces cerevisiae, which splits sucrose into its constituent fructose and glucose parts. This allows them to not have to worry as much about sticking to a strict sucrose-free diet. Beano and similar products contain alpha-galactosidase, which is produced using the mould Aspergillus niger. The enzyme reduces our propensity for fart production after feasting upon beans and cruciferous vegetables (e.g. cabbage, broccoli, etc.). These foods contain complex chains of sugar molecules that are otherwise challenging for our natural intestinal enzymes to handle. Adding more enzyme ensures they get broken down and absorbed instead of being converted to gas by gut microbes. Pancreatin and pancrelipase are mixtures of pancreatic enzymes obtained from pigs and taken by people who are having problems with their pancreas. Normally this gland dumps a bunch of digestive enzymes (lipases, amylases, proteases - these break down lipids, sugars, and proteins, respectively) into the initial part of your small intestine (the duodenum). This process is disrupted in some folks, meaning they aren't able to efficiently absorb nutrients (particularly lipids) from the food they eat and can eventually end up malnourished. Pancreatic insufficiency, as this condition is known, is associated with long-term inflammation of the pancreas and is also seen in people with cystic fibrosis. Using supplementary enzymes to treat pancreatic insufficiency, while effective, is a bit tricky, since you need to get them to the duodenum right as food is moving into there from the stomach. Following a meal, enzyme-containing dishwashing detergents may be used to clean up. Amylase, lipases, and proteases act on food-encrusted dishes to remove carbohydrates (e.g. sticky rice), fats (e.g. bacon grease), and proteins (e.g. eggs). The same enzymes are found in some laundry detergents, acting to remove stains caused by these biomolecules (e.g. spilling a drop of olive oil on your jeans). They're able to operate at low temperatures, making it possible to do laundry using cold water and thus save electricity while ensuring the longevity of delicate clothing items. Personal cleaning agents may also include enzymes. Proteases in contact lens cleaners (e.g. subtilisin A, originally found in the bacterium Bacillus subtilis) are used to help remove deposits that form on lenses during their use. These deposits consist of proteins and lipids present in tears, which interact with the lens surface and end up accumulating there. Zendium, a toothpaste sold in Europe, contains the enzymes amyloglucosidase and glucose oxidase. The former breaks apart starch (often present as food residue in your mouth) into glucose, while the latter converts glucose into gluconolactone and hydrogen peroxide (which kills bacteria). Other enzymes found in select toothpastes include papain (claimed to help whiten teeth) and lysozyme (kills bacteria). Looking at cosmetics, certain at-home face peels contain proteases derived from plants (the aforementioned papain and bromelain) or manufactured using bacteria. The idea is they'll eat away proteins in your outermost skin layers, resulting in smoother skin. Last but certainly not least, enzymes have a key role in the management of certain chronic illnesses at home. Diabetics typically use hand-held biosensors to measure their blood glucose levels. These devices are based on the action of glucose oxidase. As this enzyme converts glucose in a blood sample into gluconolactone and hydrogen peroxide, it passes electrons to an electrode, which provides the necessary information to determine the glucose concentration. Dornase alfa (trade name Pulmozyme) is the human form of deoxyribonuclease I, an enzyme capable of breaking apart DNA. By inhaling a mist containing the enzyme, it can act upon DNA in the thick gunk that accumulates in the lungs of people with cystic fibrosis. This helps to liquefy the gunk, improving lung function and reducing the impact of harmful bacteria. Aehle W. 2006. Enzymes in Industry: Products and Applications. John Wiley & Sons. Vellard M. 2003. The enzyme as drug: Application of enzymes as pharmaceuticals. Current Opinion in Biotechnology 14(4):444-450.